We were excited to be welcomed back to Electra House’s Level One Restaurant on King William Street. Located upstairs at Electra House; Level One is a beautifully modern Asian restaurant with a lovely contemporary interior décor. 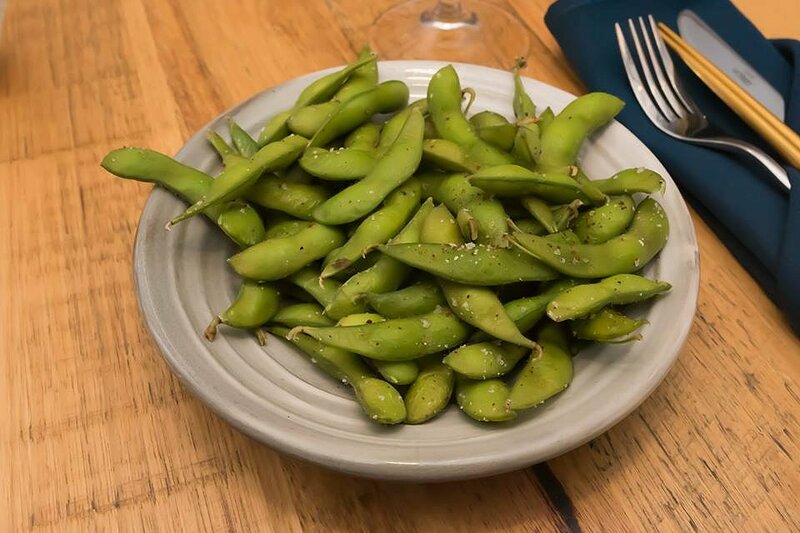 To kick off our eight-course meal, we were offered a plate of Edamame to start, which was seasoned with black pepper and sumac salt. 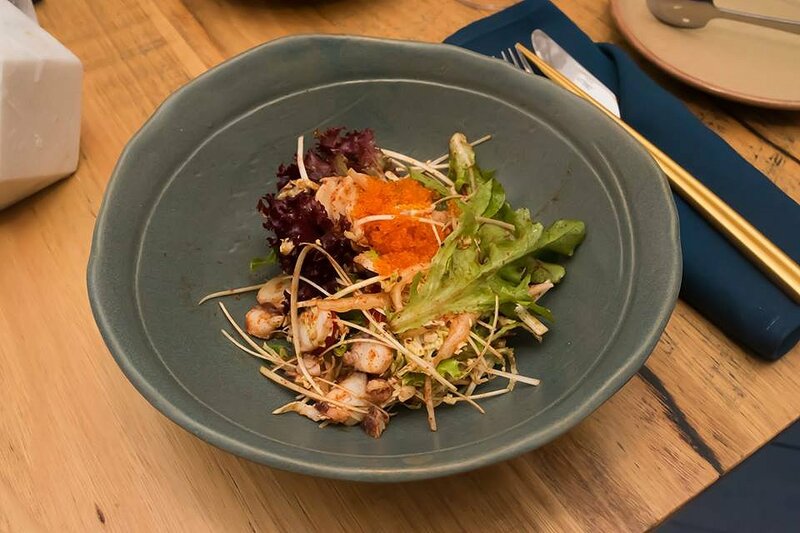 The Spicy Octopus Salad with Korean cabbage, watercress, chilli and flying fish roe, was a beautiful dish in both looks and taste. The very fresh octopus was cooked to perfection and the smooth flavours of this balanced well with the chilli seasoning. The overall dish had a lively bite to it and is definitely recommended for those who prefer a little heat to their meal. The texture and coolness of the flying fish eggs balanced well with the crunchy cabbage and the soft octopus. Overall it was a beautiful tasting dish. 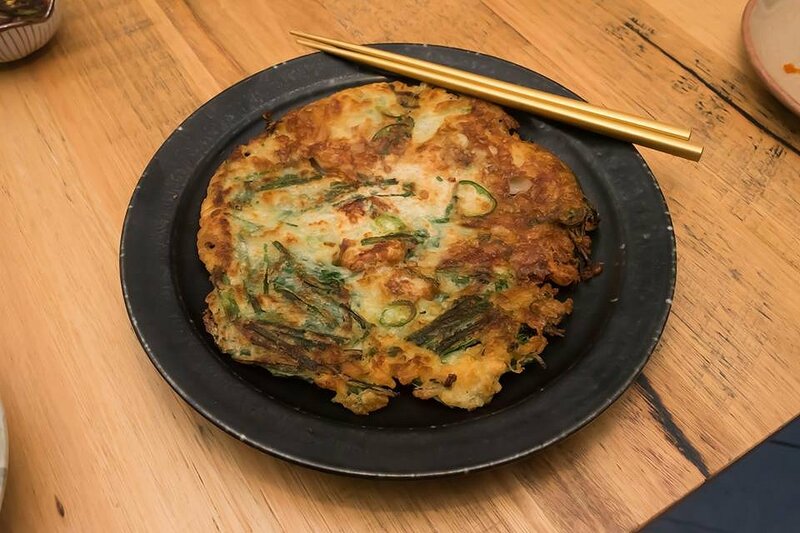 The Korean Squid Pancake, with baby squid, Korean chive and green chilli was delicious. Served with a lovely green chilli, soy and sesame dip, this dish was a beautiful combination of sweet and savoury. The chilli added a lovely small hit of spice that was well balanced with the lovely soft squid pieces inside the fried pancake. The cake itself had a lovely outer crunch with a soft centre; real traditional comfort food, and is the perfect dish for sharing with friends and family. The Chicken Wings, with crispy, sticky, sweet and spicy components, had a lovely presentation and was deliciously ‘finger-licking’ good. Even the smell made us drool before we had taken the first bite. The beautifully cooked, plump and succulent chicken drumsticks were coated in a generous thick, spicy and sticky sauce. 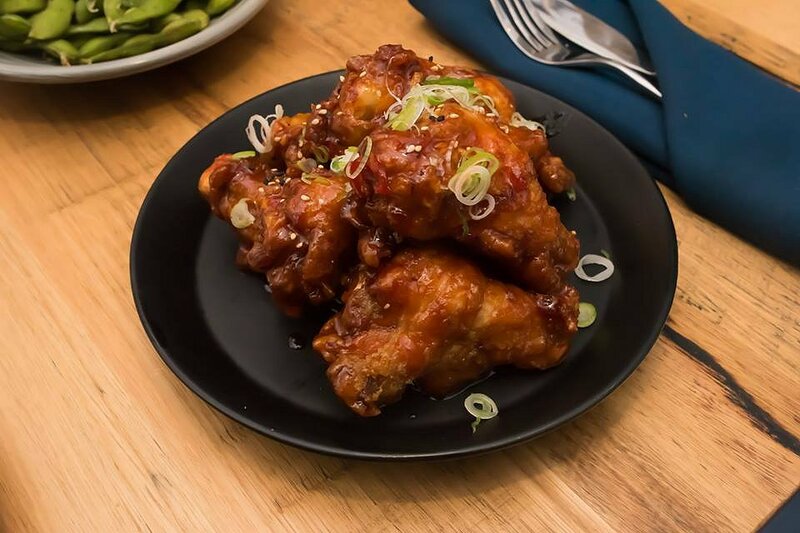 The Asian inspired wings, were moist with a slight crispy coating; a beautiful balance of textures and flavours. The Hot Soba Noodle dish with heirloom carrot, beetroot and brussel sprout was a lovely and pretty vegetarian dish. 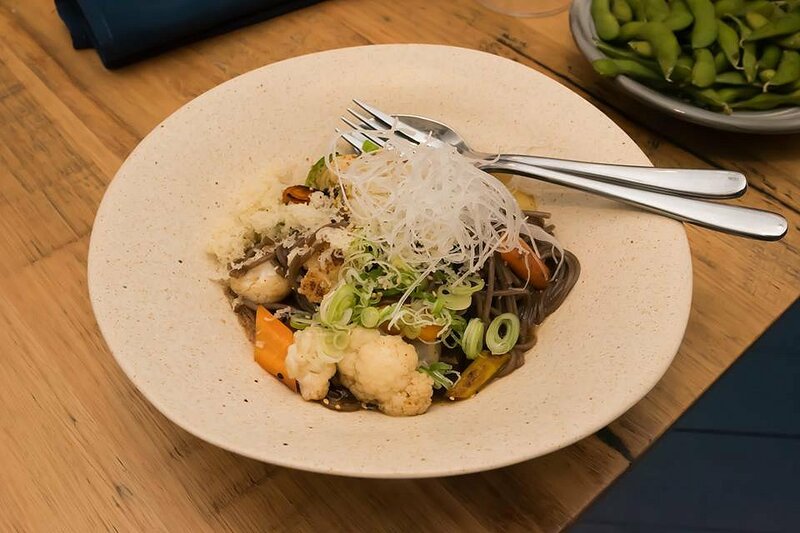 The noodles with the accompanying seasonal vegetables held a lot of flavour, especially in the noodles themselves; holding smooth textures and earthy flavours with a kick of spice at the end. The breadcrumbs on top added a mix of textures, balancing the soft textures of the noodles and the slight snap of the cooked vegetables. 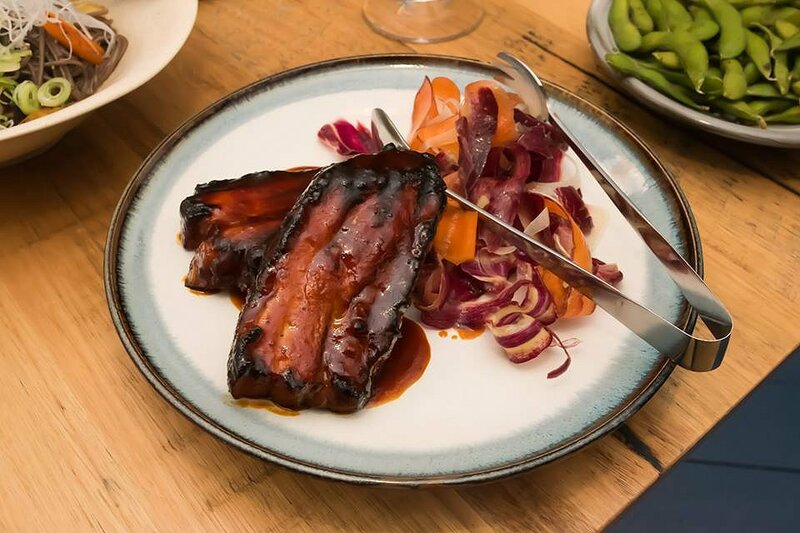 The Free Range Rack and Belly of BBQ Pork, with Korean spicy chilli sauce, raw carrot, fennel and celery heart was a divine dish. The smoky grilled flavour of the pork was well complimented with the sweet, sticky and spicy coating. The pork itself was very generous in size and was lovely and tender. The spice of the BBQ glaze coating was helped cooled by the fresh garnishes of the carrot and celery heart. The crunch of the vegetables also added a textural balance with the soft meat. The Dry aged Black Angus Ribeye (400g), with wasabi butter and an accompanying quinoa and lentil salad, was beautifully presented. 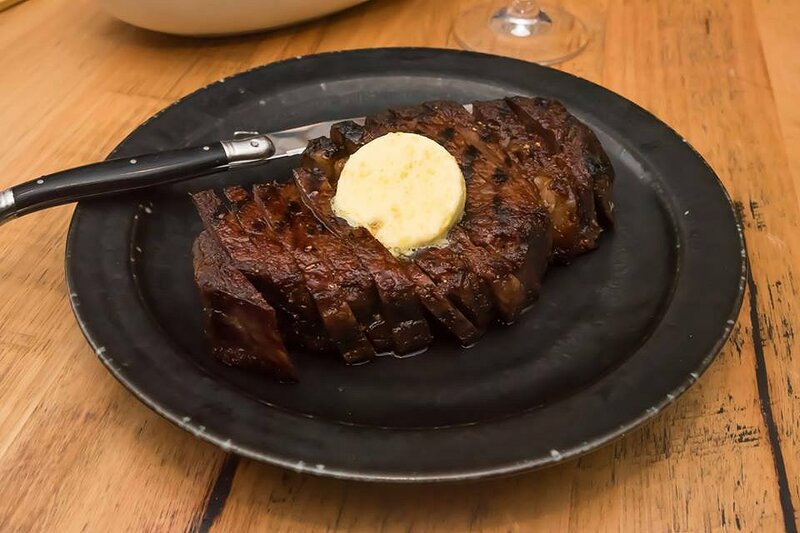 The Angus Ribeye was served sliced, perfect for sharing with friends and family. The steak itself was beautifully cooked, pink in the centre and wonderfully tender. Lovely smoky grilled flavours came from the steak, which complimented the peppery spice of the wasabi butter. The quinoa and lentil salad was refreshing and balanced well with the heaviness of the Angus steak. For dessert we had the Strawberry Choux, a crème patisserie with vanilla and chilled strawberry soup. The unique presentation made us very excited to eat and see what was inside the baked round dome, sitting on top of the strawberry soup. The dish was beautiful and I just couldn’t get enough. 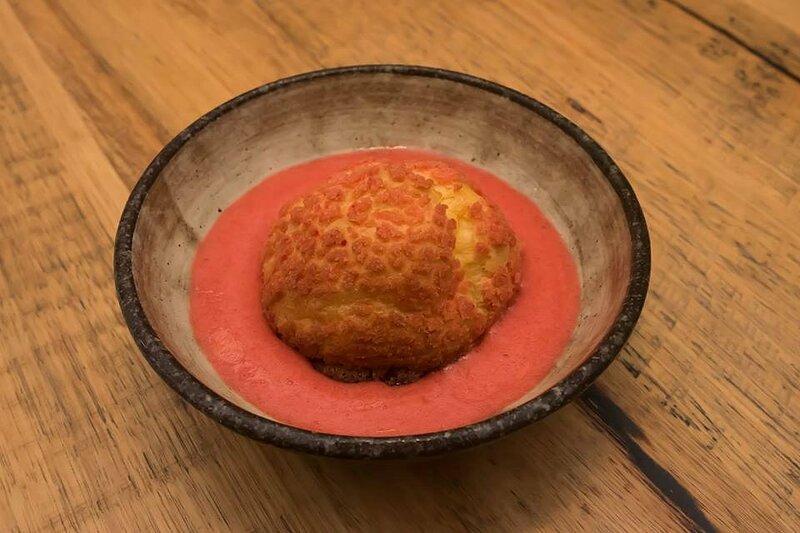 The smooth and sweet custard inside the crunchy outer dome was balanced well with the tang of the strawberry sorbet soup. The flavour combinations were a prefect combination of sweet and tang; definitely one of our favourite dishes on the dessert menu. The Level One staff were lovely and welcoming and did their best to accommodate for us, making sure we had everything we needed through out the evening. All the dishes that we tasted on the night came out quickly and were beautifully presented. It was clear that the chef included only the best fresh and local ingredients to create the meals, and that a lot of care was taken with the meal preparation and presentation. Level One at Electra House will also be making changes to their menu within a few weeks time, so keep an eye out for what they will have in store next. Level One is open Tuesday to Saturday with dinner service from 5pm till late, and Friday lunch service from 12-3pm.